The hosts have been the only team who have managed to record a comprehensive win at the World Cup thus far, with every other fancied side being put to stern tests in their respective openers. That said, the tournament has failed to produce any upsets, thus far, with the favourites just about scrambling home, but Danny Kerry's Englishmen have been the first to drop points - that too, against the Chinese, who have never been part of a World Cup before. Kerry, who had a rather disappointing World Cup with the England women's team, now finds himself in a rather precarious position after his boys were held to a 2-2 draw by the lowest-ranked team in Pool B, with a match against World Champions Australia coming up next week. To make matters worse, the Irish almost pulled off a draw against the Kookaburras, in the first Pool B clash, and may well pose a few problems for an England side who seem to be struggling without the prolific Sam Ward. From a Chinese perspective, it was a dream start indeed, and one that would please Kim Sang-Ryul no end. It may have been the debut World Cup for the Chinese but Kim Sang-Ryul is hardly a newcomer. The veteran has successfully guided the South Koreans to phenomenal success in the past and has now moulded the Chinese on similar lines. At the Asian Games at Doha in 2006, Kim guided the Chinese men to win silver after upsetting both India and Pakistan along the way. It was Kim who got the Korean men a silver medal at the Sydney Olympics in 2000 but the master coach has been passing on his knowledge and expertise to the Chinese for over a decade now. The South Koreans, at their peak, had perfected the art of man-to-man marking and were known for their sudden speedy runs which caught the opposition unawares. Both features were obvious on Friday as one yellow shirt hovered beside a taller and sturdier red-shirted player, shadowing, and frustrating the English strikers. 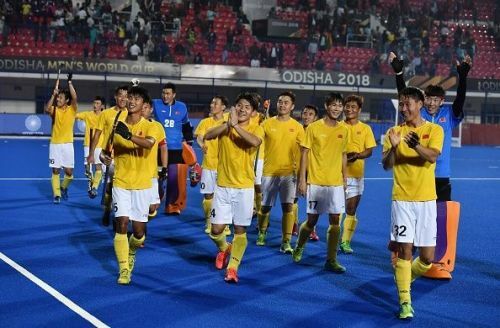 The champion Korean sides of the past possessed some great drag-flicking talent in their ranks and Kim has ensured that his present wards too have skills to match - Du Talake's goal which earned his side a creditable draw provides ample proof of China's prowess in the PC department.